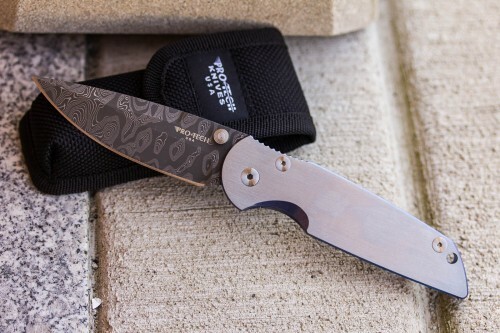 This is a very nice folder with a top-of-the-line stonewashed S35VN stainless steel blade. The blue anodized titanium handle has a sturdy frame-lock and a custom finished surface texture which provides better than adequate grip. The design is set up with a tip-up carry pocket clip and comes with nylon belt sheath to protect it. The blade is very well balanced and I have found it to be extremely easy to open with one hand using the thumb stud. It’s a classic folding design with superb ergonomics and even better fit and finish. Pro-Tech really give Chris Reeve a run for his money when it comes to manufacturing quality – each knife is absolutely superb. Check them out at www.knifecenter.com. The TR-3 is one of only a handful of manual action knives Pro-Tech manufactures and it’s a shame there aren’t more. This is an ideal tactical and EDC choice, though many would consider it a “Safe Queen” – meaning it will only beautify your storage collection. What a shame that would be as well. Not only is this one good looking knife but it’s built to some extremely tight tolerances and has some very well thought-out features. A nicely contoured handle with superb jimping locks the knife into your hand and an adequate cut-out makes using the single thumb stud a breeze. I’ts a flow though design with a very cool looking frame lock. There isn’t much Titanium removed when laser-cutting the lock which makes for a better wearing, as well as better looking lock. 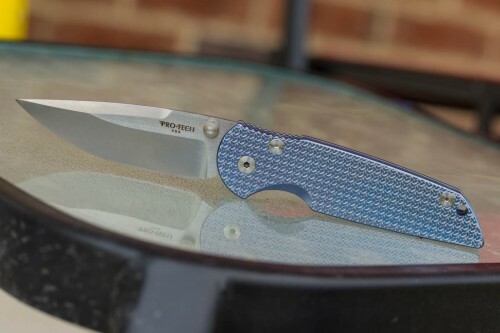 An extremely functional drop point blade, blue anodized accents and pocket clip, and of course the Damascus blade make this knife a beautiful folder limited to only 40 pieces. Check it out at www.knifecenter.com.